Santa Fe is the site of both the oldest public building in America -- the Palace of the Governors -- and the nation's oldest community celebration -- the Santa Fe Fiesta, established in 1712 to commemorate the Spanish reconquest of New Mexico in the summer of 1692. Readers of Conde Nast Traveler magazine have picked Santa Fe as the best travel destination in the world. 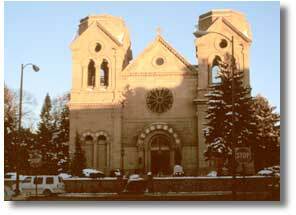 Santa Fe (meaning the Holy Faith) is an ancient city nestled at an elevation of 7000 feet in the foothills of the Sangre de Cristo mountains. It was established in 1610 and is the oldest capital city in the United States. The culture of the Pueblo people of New Mexico predated the European settlement of Santa Fe by 12,000 years. Today, the high desert of Santa Fe and Northern New Mexico are, of course, part of the American landscape but not always strictly North American. The Pueblo, Spanish, and Anglo cultures interweave the old with the new creating a rich, often mystifying effect. Cathedral of St. Francisof Assisi, just off the Plaza. What has caused the population of Santa Fe to triple over the past 50 years? Ironically, it is primarily the desire of new residents for a small town atmosphere! However, they seek this in combination with a centrally located, sophisticated urban setting with access to a wealth of cultural opportunities. For artists, it is additionally the indescribable beauty of the physical surroundings that draws and keeps them in love with this colorful city. Santa Fe is known for its many world class museums, shops and boutiques, art galleries, and wide range of entertainment from opera and dance to theater to music which can keep visitors busy both day and night. Much of what Santa Fe has to offer is located within the historic downtown area, which has a definite European feel, and can be covered easily on foot. Strict construction guidelines mandate the territorial and Spanish colonial architecture that characterizes the Santa Fe style. City codes allow no high rises to block the mountain views. For those with outdoor recreation in mind, Santa Fe is surrounded by more than 1.5 million acres of National Forest and public land which offer fishing, camping and hunting within easy reach. Hiking, biking, kayaking, backpacking, mountain climbing, cross-country or downhill skiing at the Santa Fe Ski Area, white water rafting and wind surfing are all available during the year. Golf, tennis and even bird watching are other ways to enjoy the typically sunny, temperate days. Don Juan de Onate, the first Governor-General of New Mexico, established his capital in 1598 at San Juan Pueblo, 25 miles north of Santa Fe. Thirteen years before Plymouth Colony was settled by the Mayflower Pilgrims, Santa Fe, New Mexico, was established on a very small scale in 1607. Don Pedro de Peralta succeeded Onate in 1609 and moved the capital to present day Santa Fe within the year. Peralta and his men laid out the plan for Santa Fe at the base of the Sangre de Cristo Mountains on the site of the ancient Pueblo Indian ruin of Kaupoge, or "place of shell beads near the water." For a period of 70 years beginning the early 17th century, Spanish soldiers and officials, as well as Franciscan missionaries, sought to subjugate and convert the 100,000 Pueblo Indians of the region. In 1680, Pueblo Indians revolted against the 2,500 Spanish colonists in New Mexico, killing 400 and driving the rest back into Mexico. The conquering Pueblos sacked Santa Fe and burned most of the buildings, except the Palace of the Governors. Pueblo Indians occupied Santa Fe until 1692, when Don Diego de Vargas reconquered the region and entered the capital city after a bloodless siege. When Mexico gained its independence from Spain, Santa Fe became the capital of the province of New Mexico. The Spanish policy of closed empire ended, and American trappers and traders moved into the region. William Becknell opened the 1,000-mile-long Santa Fe Trail, leaving from Arrow Rock, Missouri, with 21 men and a pack train of goods. For a brief period in 1837, northern New Mexico farmers rebelled against Mexican rule, killed the provincial governor in what has been called the Chimayó Rebellion and occupied the capital. The insurrectionists were soon defeated, however, and three years later, Santa Fe was peaceful enough to see the first planting of cottonwood trees around the Plaza. On August 18, 1846, in the early period of the Mexican American War, American army general, Stephen Watts Kearny captured Santa Fe and raised the American flag over the Plaza. Two years later, Mexico signed the Treaty of Guadalupe Hidalgo, ceding New Mexico and California to the United States. When New Mexico gained statehood in 1912, many people were drawn to Santa Fe's dry climate as a cure for tuberculosis. The Museum of New Mexico had opened in 1909, and by 1917, its Museum of Fine Arts was built. The state museum's emphasis on local history and native culture did much to reinforce Santa Fe's image as an "exotic" city. Of the 19 Native American communities located in New Mexico, 8 are near Santa Fe. All eight are Pueblo Indian tribes and their communities are referred to as Pueblos. Throughout the year, Pueblo communities surrounding Santa Fe hold special dances, feast days and celebrations open to the public. These extraordinary days present an opportunity to experience the centuries old traditions of a native culture unique to the area. At 7,000 feet above sea level, Santa Fe's has warm days and cool evenings during Spring, Summer and Fall, and a jacket or sweater is advisable, even during the summer. Day temperatures reach an average low of 40 degrees F. during the winter months, and an average high of 91 degrees F. during the summer. Nights are cool year-round in this high desert city. Santa Fe usually receives 6 to 8 snowfalls a year between November and April. Heaviest rainfall occurs in July and August. Santa Fe has 300+ days of sunshine a year an average relative humidity of 50%. Santa Fe has more events and acitvities than any other city in the Deserts Southwest. Two of the most popular events during the summer in Santa Fe are Indian Market and Spanish Market. August: Santa Fe Indian Market - the world's largest show of Native American art. More than 1,000 artists exhibit all aspects of Native American art, including paintings, pottery, jewelry and more. December: Winter Santa Fe Spanish Market - features some of the area's finest craftspeople exhibiting and selling traditional Spanish Colonial arts and modern Spanish-influenced art. Albuquerque, New Mexico: 59 miles south. Taos, New Mexico: 79 miles north. Las Vegas, New Mexico: 64 miles east. Socorro, New Mexico: 138 miles south. Vaughn, New Mexico: 97 miles southeast. Bandelier National Monument: 23 miles west. Rio Grande Gorge State Park: 98 miles north. Jemez State Monument: 75 miles west. Kit Carson State Park: 78 miles north. Pecos National Historic Park: 25 miles south. Hyde Memorial Park: 43 miles west. Santa Cruz Lake National Recreation Area: 25 miles east. Carson National Forest: 50 miles northeast. Pecos Wilderness Area: 20 miles east. Santa Fe National Forest: 10 miles east.